Veazie Veterinary Clinic owner, Dr. David Cloutier, has a special interest in cardiac medicine. He has participated in a variety of continuing education tracks and veterinary conferences, from cardiology to small animal ultrasound, enabling us to provide our patients with comprehensive cardiac work-ups. Dr. Cloutier will start out by listening to your pet’s heart and checking for a heart murmur. 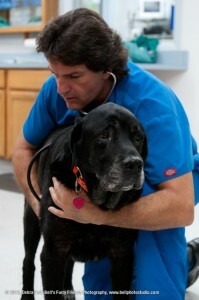 He will discuss which diagnostic procedures will best evaluate your pet’s heart condition. This may include one test or a combination of tests. Once the tests are completed, a diagnosis is made by combining and evaluating the results. Dr. Cloutier will explain what the diagnosis means for you and your pet, including prognosis, anesthesia risks, and diet or exercise restrictions. If required, medications will be prescribed that can treat the condition. Dr. Cloutier will gladly answer any questions you have at any time during the process, including any that you might think of after you get home. To learn more about our cardiac services and what to expect when you bring your pet in for a cardiac ultrasound please watch this video.